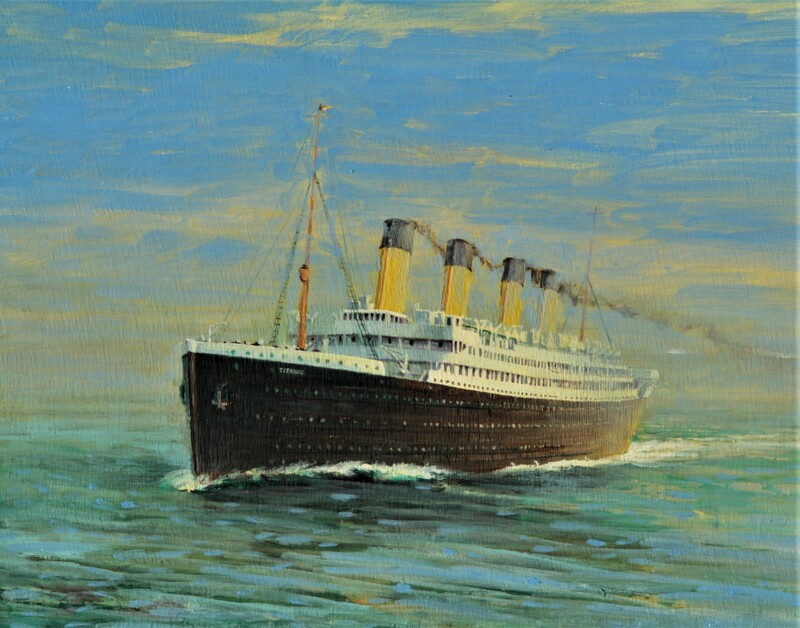 ‘Titanic’ has to be on the list of the 10 most famous ships of all time. If you are looking for the best, you have found it here. Painting measuring 38.5 x 46 cm (1 1/4″ x 18″), oil on board, yours for £1,175., ex frame, ex studio. To be as accurate as I could to the original ship, I built a to scale perspective model of RMS Titanic. People comment on the unusual, yet harmonious colours I often choose, the light, sense of real weather and the often remarkable depth I achieve, this painting as you can see even from the online image, is no exception in that respect. If you like what you see here you will love the original or I’ll give you your money back ! Enjoy. This renowned and romantic White Star Liner Titanic ‘Titanic’ is so well known I’ve forgone my usual ‘further reading section’. This painting is the smaller one of two I painted for a gallery on the south coast of England, the other, alas has sold. A fine painting adds its special ambience to any room, a sound investment, a pleasure to see on your wall.